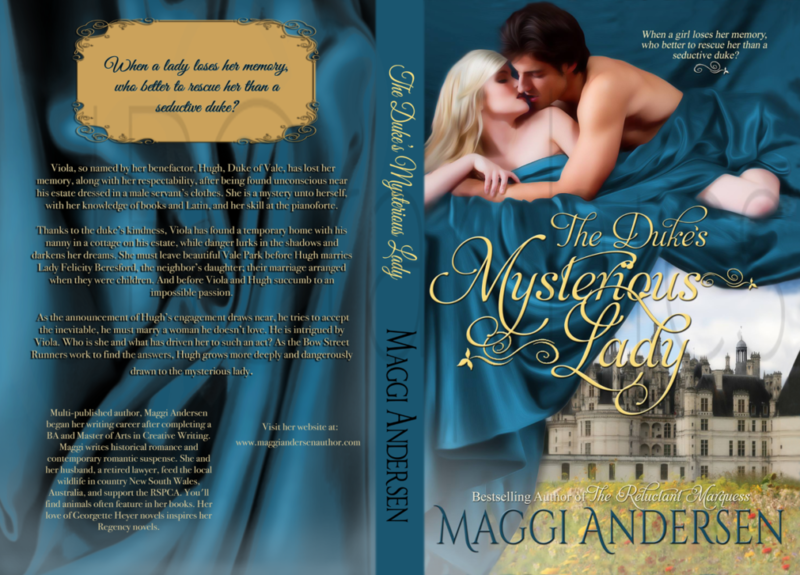 The Duke’s Mysterious Lady is in print! When a lady loses her memory, who better to rescue her than a seductive duke. Viola, so named by her benefactor, Hugh, Duke of Vale, has lost her memory, along with her respectability, after being found unconscious near his estate dressed in a male servant’s clothes. She is a mystery unto herself, with her knowledge of books and Latin, and her skill at the pianoforte. Thanks to the duke’s kindness, Viola has found a temporary home with his nanny in a cottage on his estate, while danger lurks in the shadows and darkens her dreams. She must leave beautiful Vale Park before Hugh marries Lady Felicity Beresford, the neighbor’s daughter; their marriage arranged when they were children. And before Viola and Hugh succumb to an impossible passion. As the announcement of Hugh’s engagement draws near, he tries to accept the inevitable, he must marry a woman he doesn’t love. He is intrigued by Viola. Who is she and what has driven her to such an act? As the Bow Street Runners work to find the answers, Hugh grows more deeply and dangerously drawn to the mysterious lady. As if she wished to remain cocooned in a safe place, she drifted slowly back to consciousness. Then, forced to open her eyes, she gazed blearily at the festooned valance and bed-hangings of gold-embroidered crimson. With a small distressed whimper, she fingered the spotless linen bedclothes covering her body. Her heart thudded, and her head throbbed. Panicked, she threw back the bedcover to discover a lawn nightgown, well darned, the fabric worn thin from washing. “This isn’t mine, surely,” she muttered uneasily. When she sat up too fast, her wooly head swam and her stomach churned. With a moan, she sank back onto the pillows, her cautious fingers moving over her scalp, examining the sore lump under her hair. She eased herself into a sitting position and gazed around the elegant chamber at the crimson Turkey carpet covering the floor, the green damask chair embroidered with deer, the French gilt desk and the commode. A large, gilt mirror hung above the fireplace mantel. All of which were completely strange to her. She uttered an anguished gasp. A harsh birdcall broke the silence. Swaying on her feet, she tottered to the stone window embrasure and pulled aside the heavy curtain. “Am I dreaming?” She couldn’t be, her head hurt too much. Yellow roses climbed a trellis attached to honeyed stone below her. Green fields dotted with white daisies stretched away to the distant sparkle of sunlight on water. A soft summer breeze stirred her hair carrying the sweet perfume of honeysuckle. If only her head would stop throbbing. She breathed deeply; her mind seemed in a dreadful fog. The bird called again. A male peacock strutted across the lawn, his elegant tail feathers spread out like a painted fan of vivid blues and greens. Its haughty swagger was a welcome distraction, until a horse and rider burst from a distant grove of trees, covering the ground fast. She held her breath at the sight of the high gate in the hedge barring his way, but the big horse cleared it easily. In minutes, the rider was below her, strong hands on the reins, sitting tall in the saddle. He dismounted in one graceful movement and glanced towards her window. She scuttled backward with the image of jet-black hair and broad shoulders. Curiosity got the better of her, and she peered from behind the curtain as he tossed the reins of the magnificent, chestnut stallion to a stable boy. “Make sure he’s well rubbed down, fed and watered.” His voice was deep and held an air of authority. He vaulted the steps and disappeared inside the house. The master of the house perhaps. And a perfect stranger. Her pulse raced in her throat and her head thumped. Anguished, she turned, her hand to her head, and rushed to pull the bell sash, then caught sight of her reflection in the mirror. An untidy halo of tangled hair and a pale, gaunt face gazed back at her, wide eyes dark with confusion and terror. Panic closed her throat, making her fight for breath. Nausea brought tears to her eyes and the face in the glass blurred, as unanswerable questions filled the vacuum in her throbbing head. Who was she? Whose house was this?